The path of Auro has already been a long one. I began designing the game in late 2010, and consequently went through dozens of revisions before coming up with the current concept. There have been several pre-visualization periods, wherein many different visual approaches were taken. The story itself even underwent many changes and complete over-hauls. We’ve also built one functional FLASH prototype and I’ve prototyped out the game out in board game form since then. However, actual production of the real game hasn’t started. Today, our new programmer Ido Yehieli joins the team, and Auro’s production is formally starting. Ido is an experienced independent game developer who’s been active in the roguelike community for a few years now. 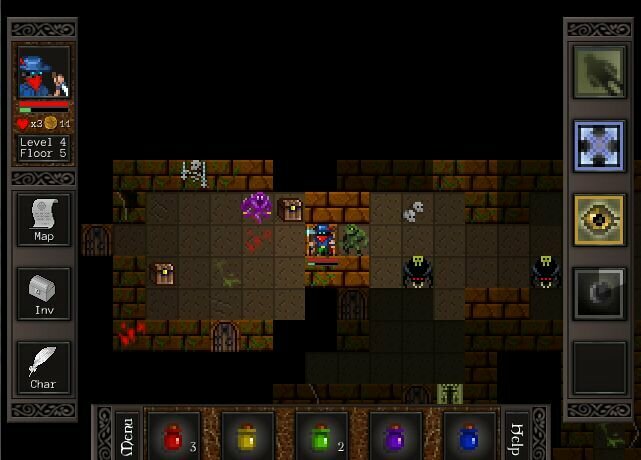 He created several 7DRL (7-Day Roguelike) games which you can check out on his page. His latest game, Cardinal Quest, is a wonderfully pared-down roguelike game for Windows, OSX and Linux (go check out the free demo!). It’s very interesting to note that he and I both started at “roguelike”, and then began to move in a similar design direction. I chatted with him Monday on Roguelike Radio, where he’s a regular along with some other roguelike gurus like John Harris. We’re really lucky to have him on board for Auro, where his experience will be of great help to us in getting from concept to execution. Cardinal Quest, Ido's latest game. If you like 100 Rogues, you'll almost certainly like Cardinal Quest. Character classes, skills, and even four-directional movement are just some of the things that the two games have in common. As usual, stay tuned for updates to our Twitter or Facebook pages for updates!